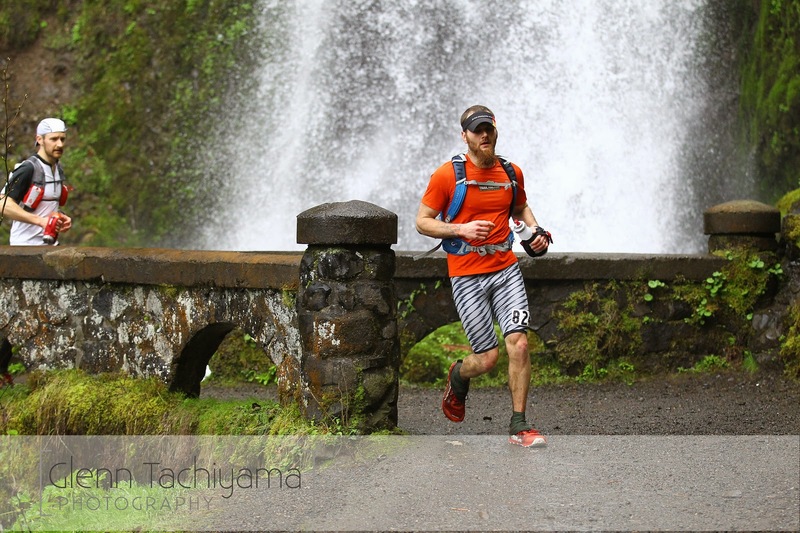 I was a semi-late signup for the Gorge Waterfalls 100k. After getting into Miwok (May 3), I wanted to find a spring 50-miler as a tune-up. There didn't seem to be much in the PNW besides Gorge, and the fact that Paul and others were registered helped me choose to do a 100k day earlier than planned. For the last three months post Deception Pass I'd been doing pretty steady and solid weeks, slowly building up to back-to-back 65+ mile weeks. I don't do high miles like other runners, but feel better keeping everything rather level. I felt great through those two weeks of training (the first two of March), and then during the taper I always feel pretty crappy and hurt more than any time I'm actually running. Come race day, however, I was feeling decent and very excited to hit the trails. Paul was kind enough to put me up for the weekend and we spent Saturday eating for three hours and talking about the race and the rest of the year. 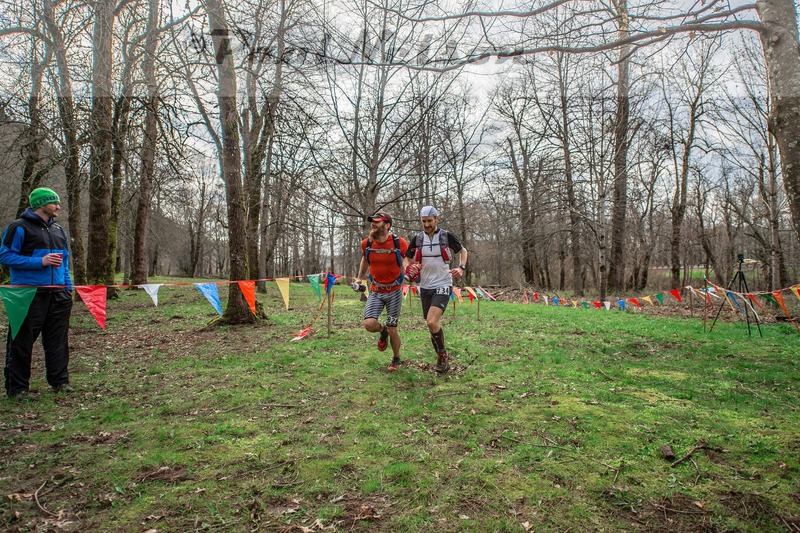 As we both were planning on using this as our qualifier for 100-mile events, our goal was to finish and we decided to just run the whole thing together. As Paul is faster than I am, I think it benefited me more :) . Waking up at 1am for the 4am start was a new experience, but after getting all the pre-race things taken care of, we stood in a dark field getting touched by light rain and waited for James to send us off. About three hours of headlamp-lit running awaited. We're back there somewhere; Paul Nelson photo. A rather large group went out, but we took a very casual pace for the first mile and into the big climb. Mostly paved going up, it was a good hike up followed by falls we could not yet see, and then a steep and tough descent on slick rocks and mud (the "cliff section" signs added some pucker). 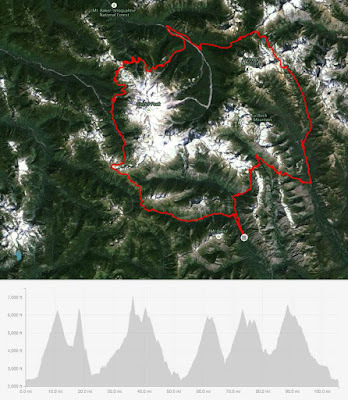 The middle was a few miles of road, lots of general rolling through mossy old growth, some nice waterfalls, and then the Cascade Locks aid station at mile 21. Mile 25; Glenn Tachiyama photo. 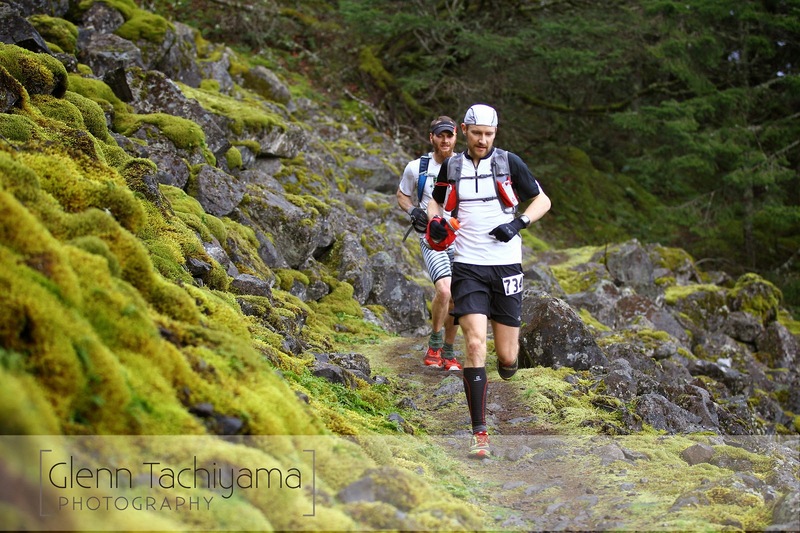 Paul and I had been taking things pretty conservative, and both didn't feel great from miles 10 through 26 until we started to see the leaders coming back past us climbing out of Herman Creek. I think that psyched us up a bit and we both started feeling good descending into the turnaround at 50k at Wyeth campground. Coming into Wyeth campground aid station, the halfway mark; Paul Nelson photo. Paul Turner; Paul Nelson photo. Although we felt like we were doing more running on the way back, the GPS says we didn't. However we both were feeling a lot better and maybe that just made the difference. We saw Matthew at about mile 33, passed a couple of guys and stayed right in front of or right behind Rhea for almost the entire second half (she finished a few minutes after us). We passed four people in the second half and no one passed us. For the most part it just was a nice long day of running and hiking with Paul. 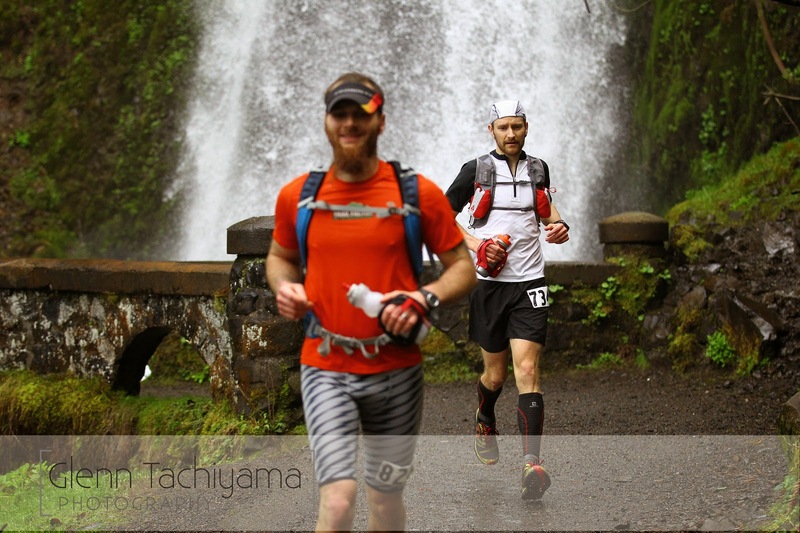 Wahkeena falls, mile 61; Glenn Tachiyama photo. 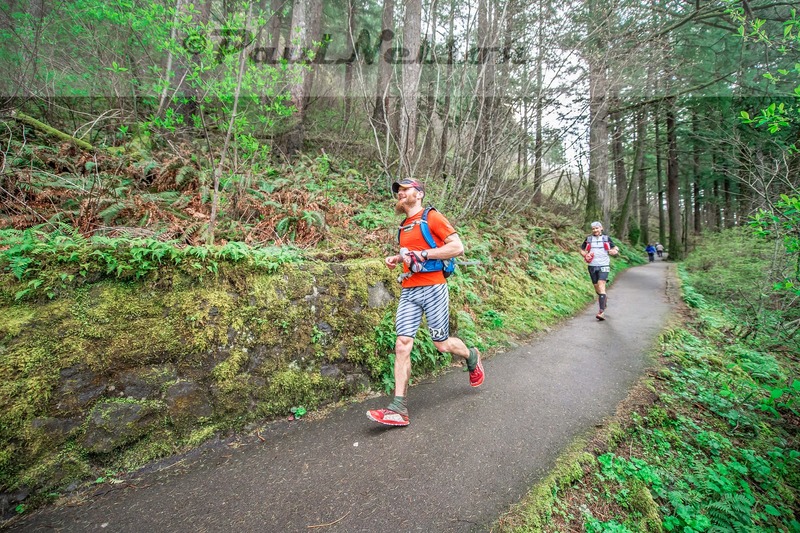 The very bottom of the last descent, entering the final mile; Paul Nelson photo. We finished in 12:58:16, crossing the line together in 18th place overall (14th for men). We ran the first half in 6:09, second half in 6:49; for comparison, the winner did 4:40-5:12. 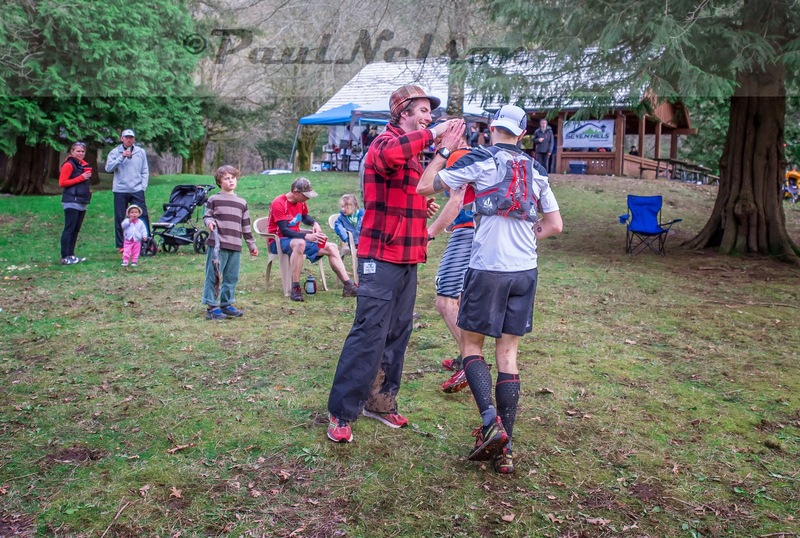 All finishers guaranteed a tired high five from RD James; Paul Nelson photo. It was quite muddy from all the rain and the 300 runners doing the 50k the day before. There were a few smooth dirt sections and maybe 4 miles of pavement per 50k, but the amount of sharp basalt scree made up for any less-technical sections. I'd even done some of the trails last October with Paul, but the course goes over more difficult terrain that got to be pretty painful by the end. 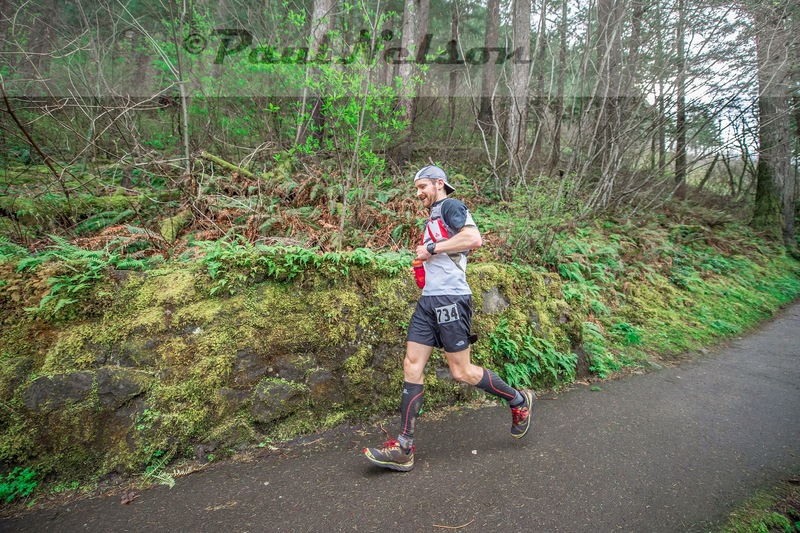 Second-place finisher Rod Bien (Cascade Crest CR holder) called it, "Legit race. Tough footing throughout." 75% of a package of dark chocolate-mint M&Ms. With the exception of the last five miles where I was just hurting, I felt like we ran a pretty steady race. Paul could have left me in the dust then, so it was nice to finish it off together and collect our 100-mile qualifiers. Paul and I also talked a lot about Plain over the weekend and he ended up registering last night! James always puts on great events: volunteers were awesome, course was well marked even though the three hours of dark running didn't have any reflectors (next year!) and I think most people who were expecting this to be one of his "easier" runs were slapped in the face (me included); 40% of the starters DNF-ed. Finish line pizza from East 20 was delicious (duh). 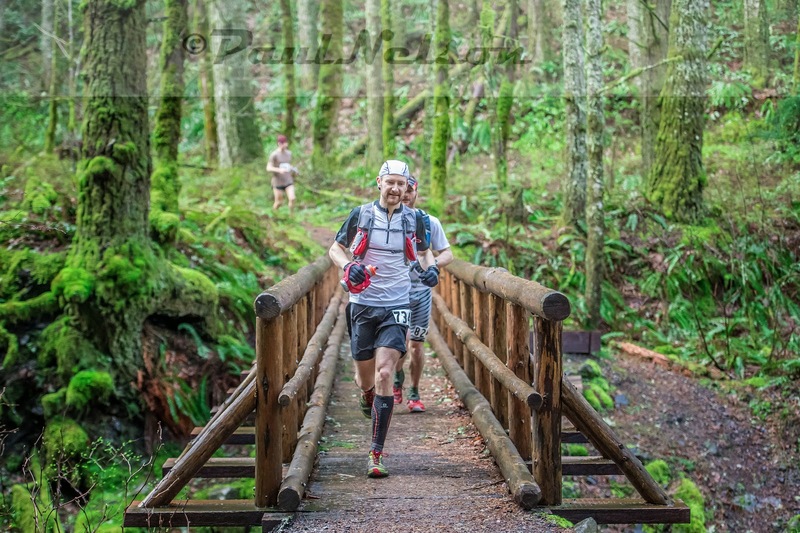 A fun running weekend and hopefully good training for Miwok in a month, and the rest of the year after that. 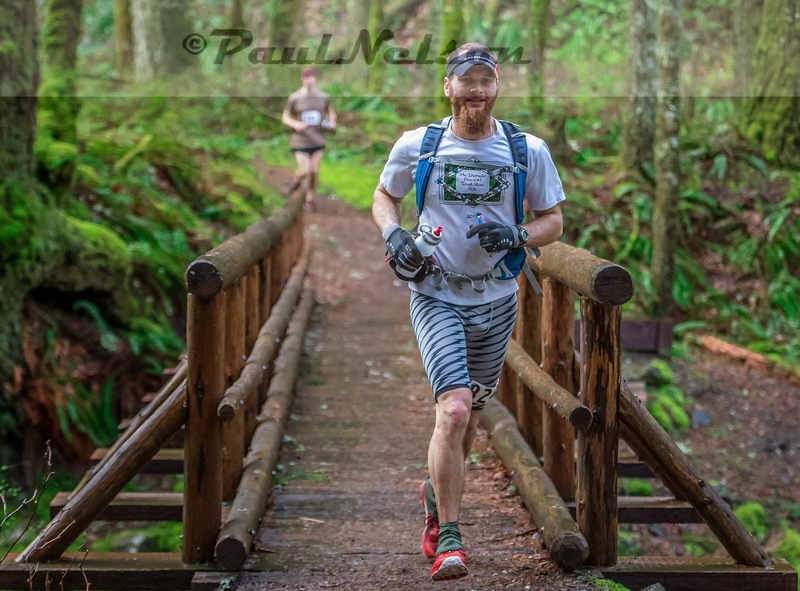 The Ginger Runner and Project Talaria are making videos of the weekend as well. Wrapping up the month, it came to 235 miles and 28,730' of gain. April wrap, off to California! LukeD 2015. Picture Window theme. Powered by Blogger.